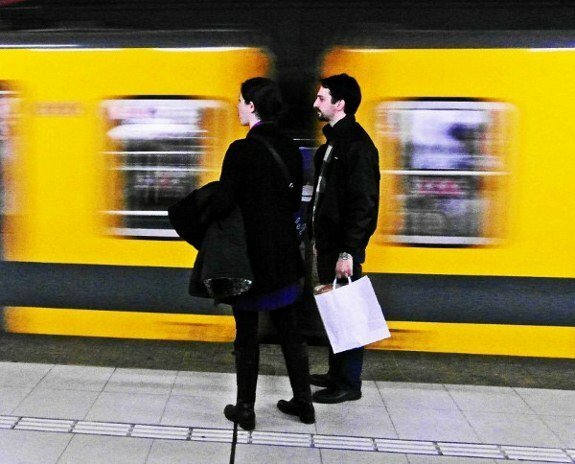 Locals warned us to be alert on the Buenos Aires subway, or “subte,” because the city is the pickpocketing capital of the world. Most major cities have petty crime so we were careful, as we are anywhere, but also wouldn’t let it affect our plans to go out and explore the vibrant city. On our very first day riding the subway we managed to get a little too close to one pickpocketing and even had an encounter with one of the thieves. 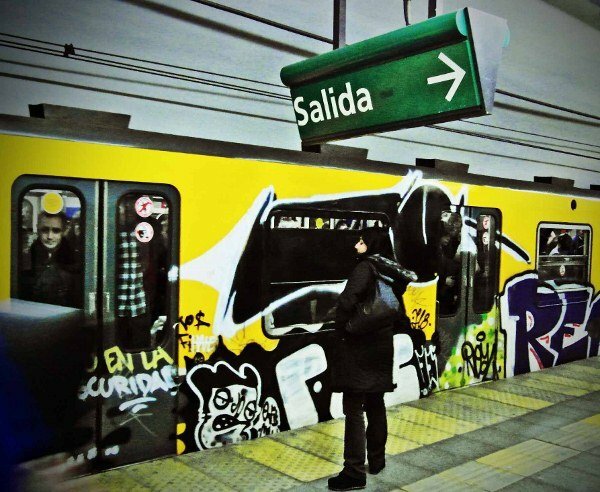 We had just stepped off the train at the crowded 9 de Julio station and were part of the scrum headed towards the exit. Suddenly a man wearing a dark blue t-shirt bumped up hard against my left shoulder. I was ready to give him a Philly elbow back to clear some space when the man abruptly stopped in front of me. This set off my antenna. Then I noticed that another man wearing a green hoodie, about three feet in front of me, had a white liquid dripping on his shoulder. A common ruse is to squirt something on the potential victim. This marks him to the pickpocket gang, which usually consists of three people, and sets up the next part of the con. Passengers like these know to be extra vigilant. One of the thieves said to the man that his sweatshirt was stained and started wiping it off to distract him. I tried to warn him but Larissa was standing right next to one of the pickpockets and I wasn’t sure if the whole thing was just a diversion to get to her. I called out “Riss, Riss!” and waved her over to me. Meanwhile, as the victim was turning to look at his stained shoulder his wallet was lifted by the third man. A woman a few feet away noticed this and yelled at him that he has just been pickpocketed. The man who had bumped my shoulder agreed and pointed down the platform in the opposite direction of where his partner was running towards the exit. I finally managed to convince the victim that the guy pointing was in on it too so he finally ran up the stairs after his wallet. I was out of Spanish expressions at that point and called the crook a shrimp (he was pretty short) holding my fingers an inch apart for emphasis. Since no police were forthcoming (for all we know I yelled for a plumber, but we didn’t see anyone running up wielding a plunger either) I parted ways with the criminal. 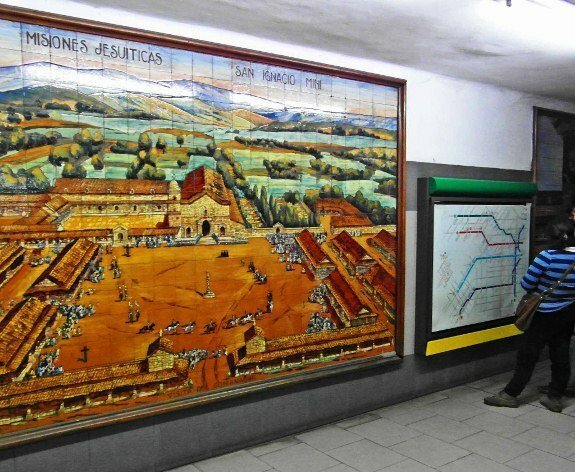 The tile murals on the subte are gorgeous, just don’t get too distracted by them. This was the second time we’d come across a pickpocketing on this trip. In June we rode the Eurostar train from Paris to London. On board we met an Australian couple who had been robbed just outside the Gare Du Nord station in Paris. When they got out of their taxi they naturally reached for their wallet to pay the driver. This let potential thieves know which pocket their wallet was in. As they walked away from their cab they were approached by several young women with clipboards who said they were getting petitions signed for a charity. We see these people everywhere, including our fair city of Philadelphia. Most are legitimate but the British have come up with a great name for them, chuggers, as in charity muggers. The woman held the clipboard up to the tourist’s chest and used it as camouflage for her hands to pickpocket him. We hadn’t heard of this scam before and thought we’d pass it along so you can be aware of it. What scams have you seen in your travels?